Pink Himalayan Salt: Does It Have Any Health Benefits? Pink Himalayan salt is a type of rock salt mined from the Punjab region of Pakistan, near the foothills of the Himalayas. It is regularly touted as being one of the purest salts available, and is said to boast several health benefits. But does this salt live up to its reputation as being among the “healthier” salts? What is pink Himalayan salt? Pink Himalayan salt is mined in Pakistan and may be up to 98 percent sodium chloride. Pink Himalayan salt is chemically similar to table salt. It contains up to 98 percent sodium chloride. The remainder of the salt is made up of trace minerals, such as potassium, magnesium, and calcium, which give the salt its light pink tint. The presence of these minerals also explains why Himalayan salt tastes different to regular table salt. How is pink Himalayan salt used? This type of salt is used in the same manner as common table salt – in cooking, to season meals, and to preserve food. Blocks of pink salt are used as serving dishes, cooking surfaces, and cutting boards. It is also used in place of bath salts, and lamps and candle holders made of pink salt are available. Why does the body need salt? Recent research has suggested that eating salt can reduce the risk of infection and kill harmful bacteria. One study on animals has also led researchers to infer that salt may act as an antidepressant. Some sources say that pink Himalayan salt contains up to 84 different trace minerals. As it contains up to 98 percent sodium chloride, this means that just around 2 percent is made up of these various trace minerals. Given the relatively limited quantities salt is consumed in, and the small amounts of these minerals in the salt, they are unlikely to provide any measurable health benefits. The majority of salt in diets may come from processed and prepared foods. Many people favor Himalayan salt over table salt, as they believe it is lower in sodium. However, both salts are comparable in terms of sodium chloride content, at approximately 98 percent. As pink salt is often found in larger sized crystals than table salt is, it does contain less sodium per teaspoon. It also has a saltier taste than table salt, meaning less salt may be required to achieve the same flavor. However, pink salt is also available in a smaller granule size, comparable to standard table salt, so this needs to be taken into consideration when seasoning food and estimating sodium intake. It is important to keep in mind that the American Heart Association say over 75 percent of sodium intake comes from the salt already present in processed and prepared foods, not what is added at the dinner table. Another purported benefit of pink Himalayan salt is that it is more natural than table salt, a claim that appears to have merit. Table salt is usually heavily refined and mixed with anticaking agents, such as sodium aluminosilicate or magnesium carbonate, to prevent clumping. Himalayan salt is less processed, and usually does not contain any additives. Adding a pinch of pink salt to meals or drinks is believed to help the body achieve optimal fluid balance, thus preventing dehydration. It is true that sodium is necessary to maintain proper fluid balance, although this is true for sodium from other sources, and not just from pink Himalayan salt. Iodine is a mineral that the body requires to maintain proper thyroid function and cell metabolism. It is present in fish, sea vegetables, dairy, and eggs, among other foods. Iodized salt is another common source of this trace mineral. Approximately 75 percent of households in the United States use iodized salt, which was first introduced in the U.S. in 1924 in a bid to reduce incidences of goiter, which is a sign of iodine deficiency. Although pink Himalayan salt may naturally contain some iodine, it most likely contains less iodine than iodized salt does. Therefore, those who are iodine deficient or at risk of deficiency may need to look for other sources of iodine if using pink salt instead of iodized table salt. Although sodium is necessary for life, too much sodium can have negative health effects, so it is important to monitor the intake of any type of salt. While sodium is necessary in small quantities, too much can have a negative impact on health. Those with kidney, heart, or liver issues, or people on a sodium-restricted diet, should monitor their sodium intake and limit their use of all salt, including pink Himalayan salt. Even people who are in general good health should monitor their sodium intake. A 2016 report from the Centers for Disease Control and Prevention (CDC) states that over 90 percent of children and 89 percent of adults consume more sodium than is recommended. The 2015 – 2020 Dietary Guidelines for Americans recommend that people eat less than 2,300 milligrams of sodium daily. This equates to approximately 1 teaspoon of regular table salt. An excess of sodium in the diet may lead to high blood pressure among other things. Most people consume much more than this. When people take in more sodium than they need, their kidneys try to remove the excess by excreting it through the urine. If the kidneys cannot remove enough sodium, it begins to build up in the fluid between cells, known as the interstitial fluid. This causes both water volume and blood volume to increase, putting additional strain on the heart and blood vessels. Salt in excess amounts may even contribute to autoimmune diseases, as it overstimulates the immune system. Examples of autoimmune diseases include multiple sclerosis, rheumatoid arthritis, lupus, and psoriasis. Research published in 2015 suggests a direct link between salt intake and obesity, with a 1 gram per day increase in salt intake associated with a greater than 25 percent increase in the risk of obesity in both adults and children. This increase in risk is independent of the amount of sugary drinks consumed, or overall calorie intake. At present, there is no scientific evidence to show that pink Himalayan salt provides more health benefits than regular table salt. 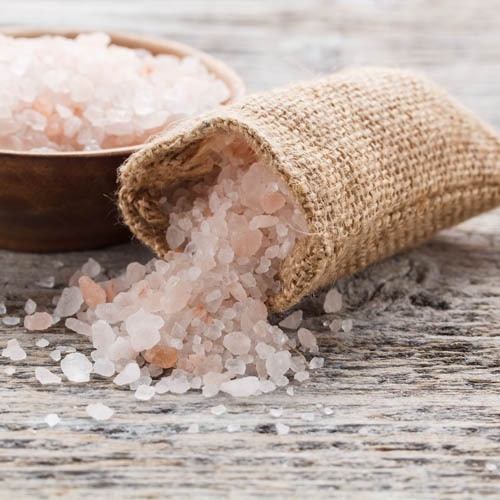 Although pink salt contains several minerals, they are present in such small quantities that they are unlikely to bring any notable health benefits. It is also lower in iodine than iodized table salts, which may cause health issues for those who do not get enough iodine from other sources. Replacing fine-grain table salt with crystals of pink Himalayan salt may help to reduce sodium intake, but, as with any other salt, it should be enjoyed in moderation. COPYRIGHT © 2016 NATIVE ROUTES, INC.